We are a preschool. 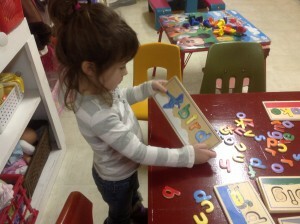 Our daily schedule and curriculum is flexible to accomodate the different ages and stages of development of children. The morning is our primary preschool session. At present we are not offering afternoons, but if there is enough interest we may do that. The afternoons are more for music and movement, and free play occupies most of the time, with teacher observation, conversations and interaction. The morning preschool activities, craft projects and lessons are laid out and discussed, but not in the formal sense, as kids are tired and less attentive in the afternoons. At the end of each session we clean up and may review the days activities and what they learned in a transitional circle time, depending on the needs of the children and the goal of the families. 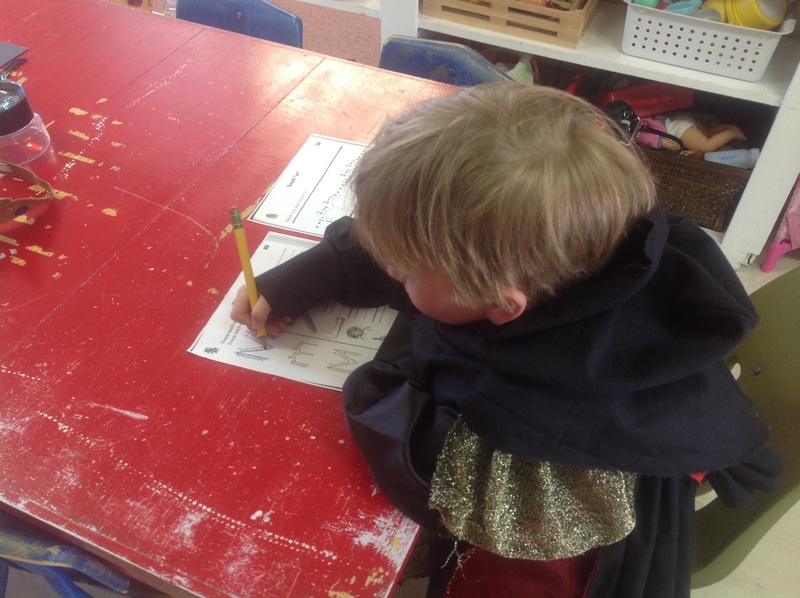 We use themes for the day or week, introducing a letter for the day or week and work the different developmental areas of learning around that theme or letter. Children who need more structure and school readiness will have a more structured program, while the younger children can participate at their level of understanding. When I went back to school in 1996 I was surprised to discovered the “new way” of doing things, based on what is called “Best Practices for Early Learning”, ACTUALLY WORK, and work well! It took practice to master them, because I had to stop falling back into old habits of discipline. I was always a believer in spanking, but I’ve found there really is a better way of handling things, and it works. I wish I knew then, when I was raising my kids, what I know now. Recently, while watching a program, (Granite Flats -I love that show. There is this sort of crazy Aunt who has some very profound things to say from time to time.) Anyway, she said this, “Life does not come with an eraser. If you want things to change, turn the page and write something new.” I love that!! Well that Aunt is not crazy, because the true definition of crazy is doing the same thing over and over and expecting a different result. She stopped doing the same thing and made changes in her life. That takes courage and determination. It also takes a new way of thinking about what you’re doing and believing that something different than what you’re doing is better. After a tug-of-war over the puzzle, and it working out with one child doing it herself, only minutes later I turned around to find her “Sharing” with her friends and “taking turns”. “Look, we are taking turns,” she announced. I’m amazed when I take the time to use these new methods and suddenly the conflict is resolved without much fighting. And the more I do it this way, the fewer conflicts come up. 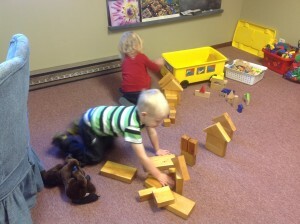 The kids learn so quickly, pretty soon they are solving their own problems or coming up with their own ways to share. Amazingly, it’s all in the wording. For example, the other day two children wanted the toy bus. One child had it and the other child wanted it, so a tug-of-war began. I stepped in and said, “It’s not ok to fight over the toys. You need to use your words and ask if you can play with it.” So, boy #1 said to the child who had it, “I want the bus.” The child said, “No.” I said to the other child, “He wants to play with it now. How about you have a turn when he is done? Let’s ask him if that would be ok.” I asked, “Can he play with it when you are done?” Boy #1 said, “Yes.” I turned to the other child and asked, “Is that ok with you?” I was quite surprised when the other child said yes and suddenly he was fine to play with another car. Many times I’ve seen the child with the toy,such as boy #1, give it up within a couple minutes. Or, if there is no compromise, I will set the timer and tell child with the toy he can play with it until the timer goes off and then the other child can have a turn, especially if it’s something they both go to get at the same time. Most of the time they have resolved the conflict on their own before the timer goes off. Now, the foundational concept to Early Childhood Education is to provide a learning environment where children feel safe, trust the care giver/teacher and are having fun while they learn. It teaches us how to motivate young children and compensate, or eliminate the three areas that cause the most problems in their ability to gain the most comprehensive brain development. So, a good quality preschool needs to have, at the minimum, these three components: feel save, trust the caregiver and have fun. Naturally to an untrained observer it might seem that all they do is play. But, they are learning while they play. It’s not a free for all, chaotic play that gets out of hand. 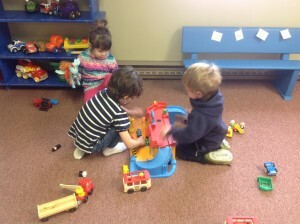 It is a well organized thought-out routine of play that can have great impact on cognitive development. 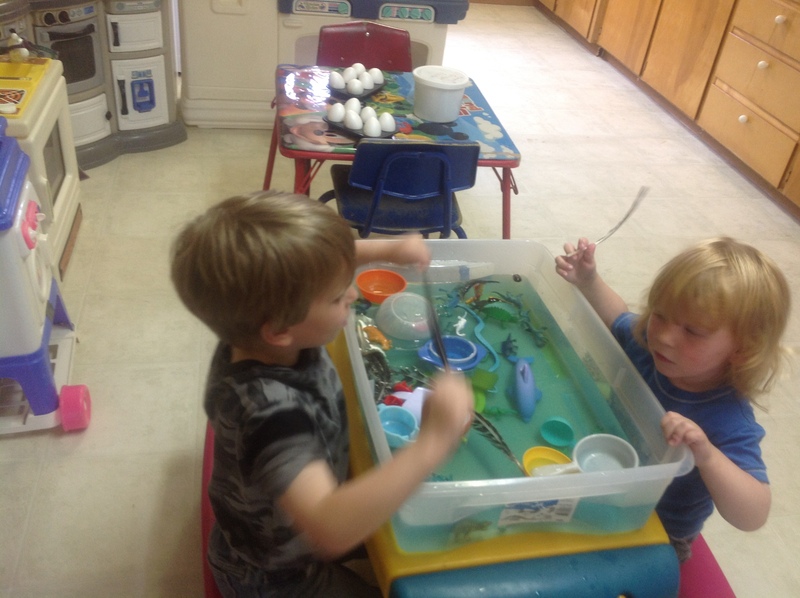 At Champion’s Choice, we provide a balance of child directed play, teacher directed activities and structured lessons. Teachers actively participate in the activities and play, conversing with the children. We have an average of 45 minutes outside to work off the high energy, and one hour of structured lessons broke into 15 minute segments with 15 – 30 minute free play segments between. This allows the brain to process the concepts they just learned. We also have a mid-morning snack and lunch. The lessons themselves are hands on for the most part, as abstract concepts on paper are not appropriate for this age. We also try to eliminate the electronic toys and learning devices. 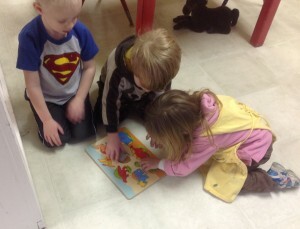 There are some that have learning games to help them memorize letters and numbers. But studies show they can inhibit them from being able to develop cognitively. Because the toy is feeding them information that they should be figuring out on their own, they do not generate the kind of learning that enhances their brain development in the best way. It’s the figuring out cause-and-effect that creates and builds the cognitive pathways in the brain: the experimentation of what makes this block not float, or what makes these two blocks fall over when I put them on top of each other, and doing that over and over until they figure it out, is what unlocks the brain to receive the information and store it in long term memory. I know that this philosophy maybe hard to believe, and to be honest, at first I was skeptical. I thought it was the “feel good” psyco bable I’d heard where you never say no. The kind where you allow your child to throw tantrums, destroy the house, swear at you and say all kinds of very inappropriate things so his little self esteem won’t be damaged. I also thought I’d hear all kinds of philosophies that would conflict with my own beliefs. So, I was actually shocked and pleasantly surprised that most of the training having to do directly with children, methods for teaching, and the understanding of their emotional, social and intellectual development was not a bunch of gobble-D-goop. It was solid facts based on statistics. Another thing that really surprised me was the similarities in the values taught in the Bible and the moral values and character building taught in Early Childhood programs. It’s the simple stuff: treat others the way you want to be treated, share and learn to solve conflicts without fighting. Something we could all use a bit of. 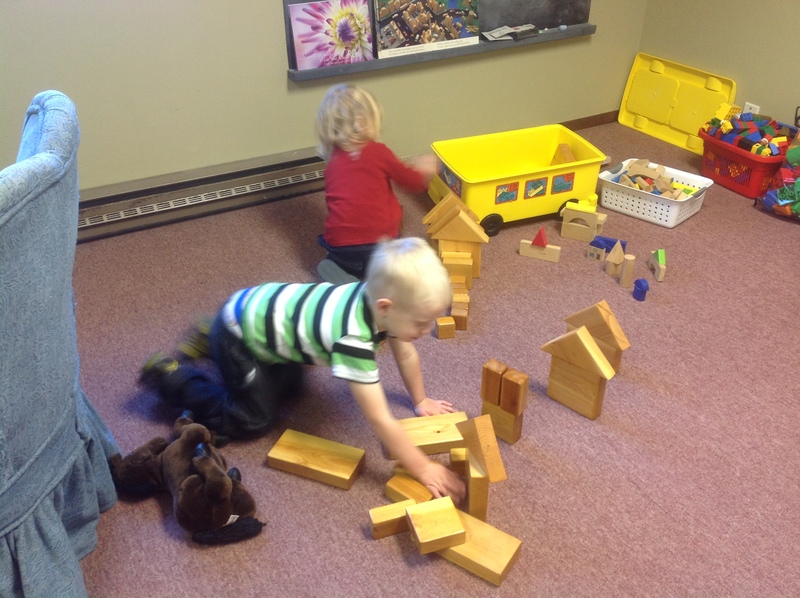 But even bigger than all of that was the need and importance that preschool really makes in the life of a child. It’s not all about being ready for Kindergarten, although that is important for many reasons I dont’ have the time to go into here. 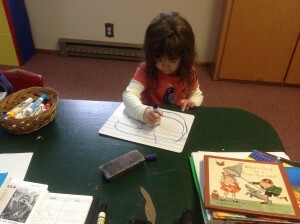 But there is a marked improvement in the lives of kids who go to preschool. It has to do with the time when the brain is developing and how it develops in the early years, the window of opportunity when the brain is at it’s peak to receiving information and how it sorts and records that information. The studies indicate that if the brain is not stimulated to learn during this time, and it misses some of the valuable input, it will not be able to “catch” up later. The door of opportunity shuts. This is the time children develop character, nobility, honesty, integrity, commitment, determination, perseverance, creativity, curiosity about the world, and an interest and love for learning. This is the time when the foundation of who they will become is formed, and that will last a lifetime. 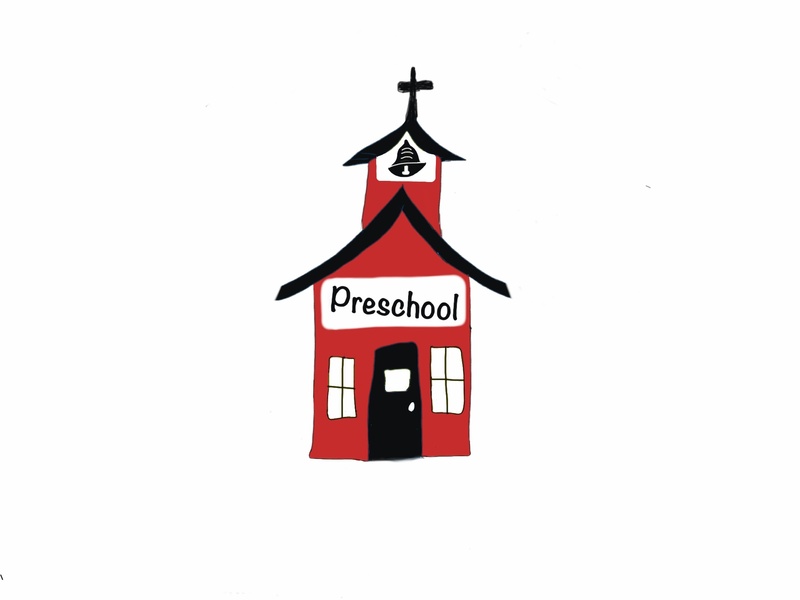 Our preschool curriculums are designed to meet Montana Early Learning Standards in each developmental area. Our curriculums are presented with a God-centered, age appropriate view based on the absolutes of God’s Word. At the same time, we use age appropriate approaches with play centered learning and hands on activities to make each concept fun and meaningful to the child’s world. With theme based lessons we use an integrated approach that includes the seven developmental domains: Social-Emotional, Physical, Language, Math, Social Studies, Science and Creativity. Depending on the number of students enrolled and the goal of the families, we may use one of several curriculums or combine them to have a comprehensive program. We have used “Mother Goose Time”. This preschool curriculum applies the latest theory and research on best practices in teaching and learning and the content standards developed by states and professional organizations. While keeping an environmentally-based approach, Mother Goose Time Preschool Curriculum clearly outlines the teacher’s vital role in connecting “content and teaching” with hands-on learning for preschool children. 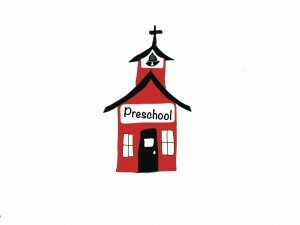 We have also used Mother Goose Time Bible based option for Christian preschools. It is very basic, featuring a Bible story and Bible verse, along with daily activities that integrate the seven developmental domains. 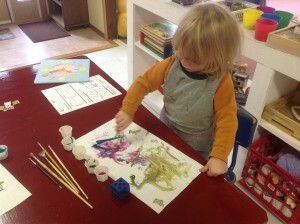 We have used Creative Pre-K, for the hands-on creative teacher. This is a themed program with great activities and lesson guides. Our trained staff finds the developmental domains within these activities and expands them into a comprehensive program. 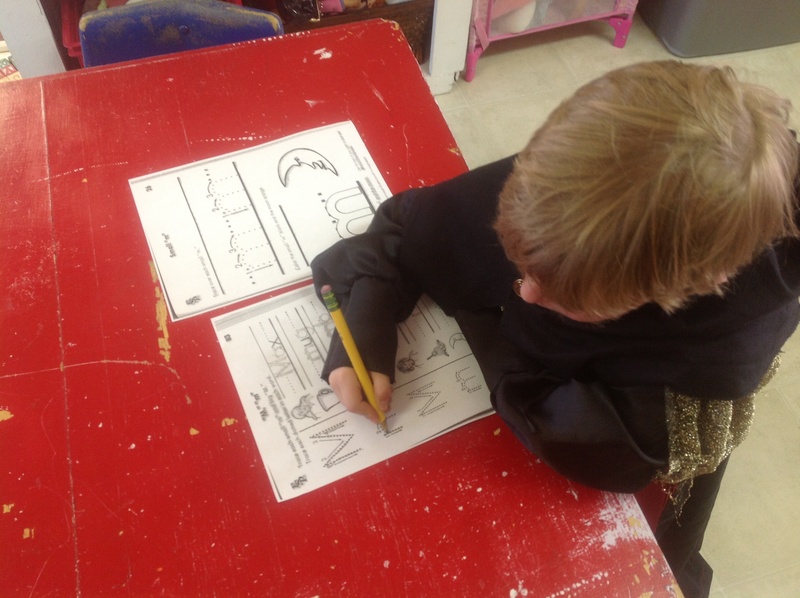 With all of these, we supplement the “kindergarten” readiness goals with writing practice, math skills and language sheets. These seat work segments are about 15 min. long – longer if the child is engaged, and shorter if they are not mature enough to handle that. If they don’t finish the page, it is sent home or saved for later. Students are encouraged to finish, but not required to. The daily schedule below is a guide and may change as needs and interest change. It is our goal to incorporate Biblical instruction into our daily routines as well as into our curriculum.